After the modern Mexican state came into being following the Revolution of 1910, hyper-masculine machismo came to be a defining characteristic of "mexicanidad," or Mexican national identity. Virile men (pelados and charros), virtuous prostitutes as mother figures, and minstrel-like gay men were held out as desired and/or abject models not only in governmental rhetoric and propaganda, but also in literature and popular culture, particularly in the cinema. Indeed, cinema provided an especially effective staging ground for the construction of a gendered and sexualized national identity. 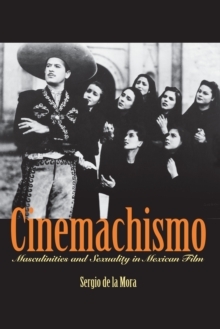 In this book, Sergio de la Mora offers the first extended analysis of how Mexican cinema has represented masculinities and sexualities and their relationship to national identity from 1950 to 2004. He focuses on three traditional genres (the revolutionary melodrama, the cabaretera [dancehall] prostitution melodrama, and the musical comedy "buddy movie") and one subgenre (the fichera brothel-cabaret comedy) of classic and contemporary cinema. By concentrating on the changing conventions of these genres, de la Mora reveals how Mexican films have both supported and subverted traditional heterosexual norms of Mexican national identity. In particular, his analyses of Mexican cinematic icons Pedro Infante and Gael Garcia Bernal and of Arturo Ripstein's cult film El lugar sin limites illuminate cinema's role in fostering distinct figurations of masculinity, queer spectatorship, and gay male representations. De la Mora completes this exciting interdisciplinary study with an in-depth look at how the Mexican state brought about structural changes in the film industry between 1989 and 1994 through the work of the Mexican Film Institute (IMCINE), paving the way for a renaissance in the national cinema.